In this blog post I’ve decided to do something totally new; something that I’m guessing is going to help a lot of coaches, therapists, consultants and trainers. 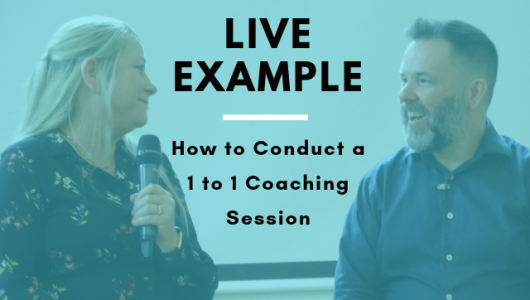 I’m going to be walking (and talking) you through a real, no holds barred, 1 to 1 coaching session I did recently that had a huge impact on the client I was coaching (the client is a 7-figure coach, Pam Featherstone). In this video, you’re going to get a ‘directors commentary’ on the entire session! – learn how to respond to the answers your client gives. I recommend you put aside an hour to watch the video below (I promise you, it will be worth it). Here’s why I’m sharing this with you: one of the best ways to learn a new skill or improve an existing one is to watch and observe a live demonstration in real time. So I hope you’ve learnt something new today and had an insight into how you could take what I do and apply it to your practice. If you like this type of content and find it helpful, then do let me know by commenting below. I would love to know your thoughts. So informative from so many levels. Wow! I wanted to stop you so many times to ask questions about downloads I was getting on the process you were using. I coach in a similar way so it was great to triangulate and learn a different angle on the process of creating and holding the space for them to get self insights and thus spend time with more of who they really are…to themselves. This one coaching session could be a week long seminar in itself. There is so much there! I am seeing other coaches and teachers getting to a similar place, more and more, like something is preparing us as a people to get on the ship. We just happen to be there ahead of some of them. Maybe to help welcome them aboard. Anyway i am more than happy to share my insights I received about this session with you…as you have so openly shared your gifts here. I can do it by writing, audio or video if you are ever interested. Thanks again for this Awesome video Jamie…it is a great gift for me today…and all-ways!!! This video was especially good, I thought. It’s great, the way you never hold anything back. Thank you so much! It was hugely informative and helpful! So love seeing the space you create with your clients, simply beautiful to watch! Here is what I saw and really liked about this session with Pam. Of course it is different today than it might have been yesterday. I will write as close as i can with the order of the video timeline. When you told Pam early on… this was something everyone does ( on the subject of the Difference between her knowing what to do and not doing it) she took a nice long deep breath and it relaxed something in her. You slowed down and said you felt “Closer to her”. This was nice and i really like how you pay attention to that in you and allow yourself to slow your words. Maybe you could explore this “Closer to her” and “Connection” in a talk sometime and what it means to you and how you know it. She missed the bigger inductive question about why the world feels like this and went back to self which you nicely followed that track instead. In Piaget’s work this is typically something from a younger age involving the processes of Centration and Egocentrism interacting together and not being able to see with a wider view. Information and decisions from there become very limited. The concepts of “Non-truth” keep a very narrow deductive viewpoint in place and seems to block a more expansive view or any counter examples from coming into play. Her feeling guilty during taking time for herself seems to be based on “the right level of commitment to it”. Her meaning of Commitment seems to be the word that keeps her stuck…and more specifically to herself it has different connotations in different contexts for her which you beautifully pick up on and play with later in the video. At this point you stop her and adjust her mic and then ask her that first more generalized question again. This is really great because she will now hear her internally skewed reasoning out loud and outside. When thinking it in her head there is no critical factor but when she hears it through the her ears she will evaluate it differently with other resource as a professional with full critical awareness and not the small and familiar old way… inside her head. She now has access to her thoughts with a bit of disassociation (NLP type) from it and i would guess knowing your work that she can now start to see and process that the thoughts are informing her emotions. You really open it up here and keep these thoughts stable by writing them on the chart for her to not only hear but see and process them through more resources and closer to the truth. Really nice! I also really like your VR goggles model. It is cleaner than the Carlos Castaneda model i have been using from his book “The Active Side of Infinity” about foreign beings occupying our mind since a young age… that we think are really us. or…We are not our thoughts…they are just something that runs through us and all humans…and not who we really are. Your VR goggles are a great way to make a distinction between what we may have gotten used to as our own thoughts but becomes immediately apparent because we can take them off and see they are really a filter and not us. Most can experience this directly in today’s world. I will be adopting this model…thanks! Then your immediate switch to “connection goggles”…. and what they know and don’t know which she can then apply to her guilt and commitment goggles. The two juxtaposed feelings are now occupying a much closer space and can be informed by each other and maybe a third position. About what you said about choosing…The Buddhists talk about the first and second dart. We get caught off guard most of the time with the first dart and react and if we seek the gap between the first and second dart(Our second response) for a choice point of where our attention goes (goggles). While we cannot control our response to the first dart…however if we seek the gap between the first and second dart enough…something starts to happen with the first dart as well. This is what i see you doing so well in your process. With the gap…the best answer is already there we just need to allow the space for it to happen. When Pam says her perception is not her reality… you had caught her access a nice long Vr eye access and then say “yeah” and then asked her for more by “What do you mean by that?” This is a really nice confirmation that you understood something and for her to keep going…i really like how you do this in different coaching sessions i have watched recently that you have posted. I can tell the difference from 20 years ago when i had a kind of stake in being invested in the “being right” mentality either conscious or unconsciously…maybe both. Beginning Letting go of that became a fun journey of exploring what is to come in the revealing of the moment as the client speaks next. I notice you doing this all the time. You are still engaging in the process without investing in content. I notice many coaches are so into content, being right and technique that they miss reality …and reality seems to already have it handled if we stick with it. We have to know enough about this process to shut down “I know” and be comfortable with “I don’t know” because it is so much more rewarding to somehow be a front row observer of reality in action instead of the second hand left brain concepts. Once you have played there enough it seems to provide its own reward and encouragement for seeking that space. She has an “I don’t know” about herself because she cannot see herself on the outside like she can do so well with her clients. “I don’t know” can have a lot of negative connotations to people. When parents asked us why we did things we had better come up with a “Good” answer…”I don’t know” ( which was probably truth) Was not sufficient for most parents, teachers etc. and as you teach… “I don’t know” can be so wonderful to experience… and in truth. I think the deep work is complete at this point and you are now giving space for it to percolate fully to the surface…she looks completely different. Now your talk to her about emerging her real self in a perfect Pam fit way and then your amazing apply to self re-frame flip about “commitment” to eat the whole ice cream store…really begins to open the shutters to let light into her conscious mind. Well done… on whatever level you did that! The Pam she is, after this experience will be without the weight of her old definition and her old identity as commitment …and as we see the proof is in the pudding that the real Pam doesn’t need to carry the weight of her old committed self and it is really cool that she doesn’t even remember what it was all about. How cool is that! Final thoughts…You really help redefine concepts people are stuck on and keep them from seeing/experiencing the truth/reality. e.g. What her body and mind may represent as a concept “disaster” maybe as an embodied cognition vs what is closer to reality. Metaphors in Pam’s head of “Battles in her head” “oxygen masks first” keep her being informed by them as opposed to reality. Feeling she didn’t deserve it vs doesn’t mean she doesn’t deserve it…brilliant! She was being informed by the feelings via artificial concepts, not reality. It is almost as though the feelings backward engineer a belief to make it make sense. “Yes..it must be this reason” “This makes sense to me”. The concepts go from concept to inside instead of inside out. It seemed to me that around this point she shifted from seeking outside for approval to knowing it Inside out. She deserved what she already had by experiencing it. Thanks again Jamie for being so generous with your work! PS what you said that you had heard from Jay Abraham in your 10 minute video answer…floored me …powerful! Great that you get specific on WHEN she feels guilty. Most would just accept the answer and assume they know what they mean – and be wrong. The distinction between “I choose my goggles/feelings” and “I’m aware of my goggles” is – as you put it profoundly different and you caught that beautifully. The reminder that “I get that – intellectually” is really a “I don’t get that”. When we say that our brain goes “got it. next.” and stop exploring. Also great to let us know that you don’t know where you are going with the session – no absolute, specific goal, but a clear direction. We, as coaches, often insert goals consciously and unconsciously that is based on guess-work on our side. Be present and connected and see what comes up. The “I need for you to get a result”- coaching is short-term and leads to a “perform to be happy” life. Thank you for being in the moment and being ok with whatever happens! Brilliant demonstration of long term, life enriching coaching. Not spending time on the issue and the explanation on why not spending time there is really helpful for any coach. The issue is most often not the issue. No plan, commitment or to-dos, just insights, so the client can go to a different level. Perfect. “You don’t need …” sets her free to bring out her true self and not rely on the shoulds. We get to see you do the work and understand the structure within the work. Thank you Jamie, Although I don’t do a lot of coaching these days, I found it useful for reminding me to listen well and to clarify rather than assume I understand what the other person means in all areas of my life. I find it quite interesting that she did not see getting herself into shape for her clients as work doing for herself can only enhance what she is doing for her clients, for me I could not take advice from someone who is not living what they are advising at least on some level..
Another awesome Jamie. To understand the structure of the session, see each question broken down as to why you’re asking and to watch it all unfold. Super helpful, thanks! Hi Jamie it was a powerful session!!!! I love it and it is very beneficial and informative for me as a new coach. I would love to have more clarity about the goggles method. I got a bit confused as I understood that the goggles is our perception or the story behind what is going on in pam’s Case she knows the how to do but she is not doing it because the goggles that she is putting or the story that she is telling herself is not making her taking action to achieve what she wants in this certain area in her life. Now what I was confused about is you told her it is not about which goggle you choose but isn’t it about which goggles we choose?!!!!!! Can’t we choose the goggles or the story that will lead us to what we wants knowing that we are already having everything we need or want but the goggles or the story is putting a barrier that is preventing us from seeing this profound truth about ourselves. I would love to know your insights about this. Jamie, this is a BRILLIANT piece of coaching training, one of the best I’ve come accross recently! I’ve watched it, shared it, and am now going to watwh it again. I was coaching someone this morning, and was aware of a decision point i was facing: do i coach on the ‘how to’, or do I point in the direction of the principles. Thanks to the insights i got from this demo, I was able to do the latter. My client even reflected on it at the end, saying this had been a different, deeper kind of coaching experience, and i could see something had really shifted for him. Thanks for sharing this Jamie, it helped me deepen my understanding.